Hissing cockroach egg sacks are kind of like human eggs -- they exist, but if you can see one it means there's a problem. Mother hissing cockroaches gestate their eggs internally and give birth to live young. After giving birth, they eject the egg shells and the newborn nymphs eat it -- a process you're unlikely to see. Madagascar hissing cockroaches (Gromphadorhina portentosa) are named for their characteristic form of communication. Unlike most insects, hissers use sound more than pheromones to tell each other what's what. They have special hisses with different meanings to scare predators, threaten trespassers, prepare for battle and achieve successful courtship. Males vigorously defend small territories within the cockroach colony. They "sword fight" with their antennae and noisily bash one another for the opportunity to acquire lady friends, who they treat very gently. Displays are impressive, but males rarely injure each other in these contests. Females hissing cockroaches are peaceful. They hiss at intruders but don't fight with each other, males or their young. Mating begins with gentle touching and ends with very loud hisses of triumph. Fertilization is internal. They're ovoviviparous, meaning they don't have a uterus, but the young develop and hatch inside the mother, who then gives birth to as many as 50 per clutch. Babies usually continue to ride around on their moms until their first molt. 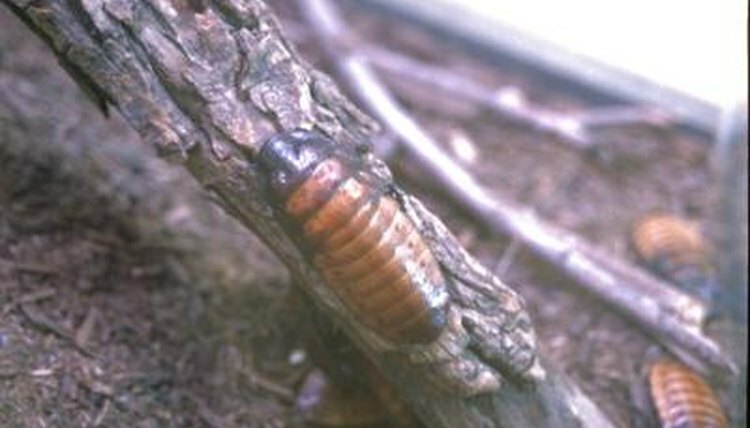 A hissing cockroach egg sack is properly called an ootheca. The sacs look like flat, segmented white worms and can be almost as long as the female's body. You really shouldn't ever see one, unless you've witnessed the mom feeding it to her newborn young. If a cockroach ejects her ootheca before the babies are born, it's the equivalent of a miscarriage. The eggs are dead or otherwise not viable. If this happens more than once in your colony, it's time to ferret out and correct the source of the problem. One of the drawbacks of keeping pet hissers is having to hide their awesomeness for their health. Wild hissing cockroach colonies live in small, dark spaces, such as hollow logs. Living in a glass house can be very stressful, especially if lights are on most of the day, and stress is a prime culprit in failed hatchings. Incorrect diet can also cause ootheca loss. Hissers don't need fancy food, but they need a proper balance of carbohydrates, protein and the correct types of fat. Experienced keepers recommend a basic diet of chicken mash or dry dog food, supplemented with vegetable matter -- not too fresh for these detritus-loving guys -- seasoned with a few drops of olive oil.